Designed and manufactured by Potterton, the Assure 12kW is a condensing, wall-mounted, compact, System gas boiler that can help to save space around your home and reduce energy bills. The Assure System boiler is a highly efficient unit, boasting an efficiency rating of 92%, giving it an ErP A rating for heat. An output rating of 12kW makes this a suitable boiler for homes with 1 bathroom that don’t have a high demand for heating and hot water. Thanks to being a compact and lightweight unit, weighing only 28kg, with front access to all components, you’ll be saving time and money on the installation, servicing and any maintenance. This highly reliable range of boilers have been designed with a variety of options, including being available as a Combi or Regular, as well as a System boiler. There’s also a choice between a range of output ratings in addition to the 12kW, which includes outputs of 15kW, 18kW and 24kW. This boiler comes with an option of output ratings including an 12kW 15kW 18kW and 24kW. The 15kW output, like the 12kW, is suitable for smaller homes, with 1 bathroom, that don’t have such a high demand for heating and hot water. An 18kW unit would be best suited to medium-sized homes that don’t have a high demand for heating and hot water, while the 24kW system is the best choice for larger homes with 2 bathrooms. The 18kW and 24kW boilers are also available as LPG units, giving you plenty of choice to find the perfect boiler. No matter which option you go for, all Assure boilers come with a variety of features and benefits: they’re intelligently designed to use the right amount of fuel; a central flue for ease of installation; optional outdoor weather sensor to enhance your control and comfort and a built-in drip tray for protection against water ingress during extreme weather conditions. 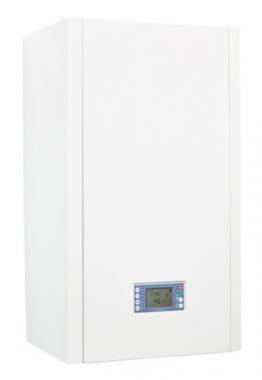 As this is a System boiler, it directly heats the central heating system and domestic hot water for a storage cylinder. Most of the important parts of the hot water and heating system, such as the pump and expansion vessel, are built-in to the unit itself, helping to make it quicker and cleaner to install. You’ll also be getting a faster response to demand for heating and hot water and there’s no need to install a feed and expansion tank in the loft. Featuring a 2 year warranty, you’ll be getting the peace of mind that an Assure System boiler won’t let you down.